To the casual observer, Rock Island Sound appears to be a small, local store quietly selling, renting, and repairing guitars. For those in the know, it is so much more. 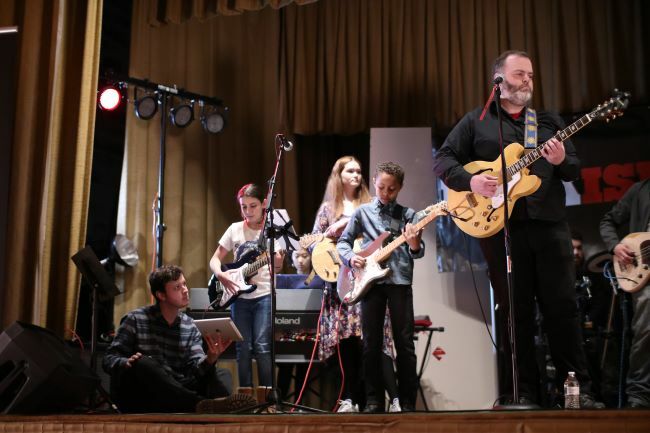 Located across the street from the Rye Marina, around the corner from Milton School, and nestled in between Scissors on the Sound and Pilates Studio of Rye, Rock Island has drawn a large collection of amateur, professional, and student musicians. Packed into a tiny storefront are four practice spaces, retail items for sale, and a rock vibe that begs to be explored. On a recent spring afternoon, we sat down with Paul Bessolo, the owner and operator, to find out how his business is doing and what’s happening on the local music scene. Raised in Argentina, Bessolo came to Westchester in the 1990s to continue his academic studies in musical composition at SUNY Purchase. Working as professional guitarist, he was also giving private music lessons across the county when a real estate friend suggested he take a look at a space in Rye that would be perfect for a shop. At the time, most of Bessolo’s students were in the Rye area, so the move made sense. 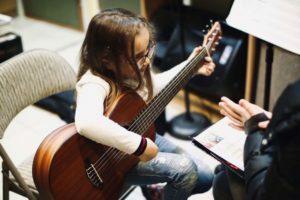 Right on tempo, Rock Island has grown to become a full music program with private lessons, jam sessions, and performance opportunities, as well as a second shop on Main Street in Tarrytown. Students — young and old — come to Rock Island because they are looking for a different vibe. They want to learn to play rock and they want to learn to play with others. Signing up for the Rock Band program, more experienced older players can find others to play with while younger students can explore their interests by signing up for fun and age-appropriate private lessons. With several levels of programming, beginning with learning the fundamentals and moving on to advanced levels of performance, the goal for many is to get good enough to play in front of audiences. These days there is lots of competition with places like School of Rock, a national franchise, whose little startup inspired the 2003 Jack Black movie of the same name. Bessolo says what students want is a program that does more than hire music teachers to give contemporary guitar lessons. He wants to ensure that when students come into his program, they are motivated to keep working. With YouTube, anyone with a computer and enough focus can set aside a Saturday morning and teach themselves to play a rock song. He made the case that to get proficient, however, “you need to practice, practice together, and you need teachers that can guide you.” He explained that student-athletes rarely question why they must stay after school every day to practice two hours on the field with his/her teammates, yet they don’t expect the same level of commitment from themselves as young rock star wannabes. It seems that when playing rock, too many want instant results with just one lesson once a week. Bessolo fell in love with rock music as a school boy in Argentina. “My dad played classical piano and I grew up listening to him play every evening after dinner.” Paul began playing classical guitar at 7 and piano at 10. Why the switch to rock? He traces it to the first live concert he attended in 1981. “My dad took me and four of my friends to the recently constructed World Cup stadium in Rosario.” At the time, very few bands played stadium shows and as an 11-year old, this made a big impression. “We saw Queen on their world tour and from the first sound I knew. I had been listening to Queen on my vinyl’s through stereo speakers, but to see Freddy Mercury and Brian May live was the best. I was already playing classical guitar and I remember saying to my dad the next day, ‘That’s what I am doing with my life’”. This past month, Rock Island Sound students performed their Spring Rock Concert at the C.V. Rich Mansion in White Plains. Filling a truck and making two trips, the teachers loaded up instruments, sound and lighting equipment, and orchestrated a concert for more than 30 students in a beautiful assembly hall typically rented out for weddings. On the set list were songs by the Beatles, Oasis, Ben E. King, Rolling Stones, Pink Floyd, Tom Petty, Journey, Ed Sheeran, and Old Crow Medicine Show. The youngest performer was 7 and the oldest pushing 50. In June, Rock Island will hold their second annual student showcase on a stage they set up in the parking lot behind their 619 Milton Road store. Knowing that the Tarrytown Rock music scene is bigger and his own retail space there is busier, I asked Bessolo what he wanted for his students in Rye. “More performance space,” he replied. Students have performed at the Meeting House across the street, but that location is not a good fit for a rock band. And last winter, the Knapp House hosted a small gathering of two adult groups and their friends and family. But that space is not big enough either. Another of Bessolo’s hopes is that musicians will shop locally. He guarantees he’ll beat any online price — music to the ears of those who prefer to support their local merchants.